" Schedule of slaves, money, and other property alleged to have been lost by the Creek Indians on the 31st October 1837 by the sinking of the Steam Boat Monmouth off Prophet's Island on the Mississippi River, on board of which together with their property they were embarked for emigration. " --- who stood on the bridge of the steamboat Monmouth and peered through the misty October [31st] night in 1837. His journey had begun at New Orleans a few hours before, and when he looked back now he could see the lights of Baton Rouge fading in the distance. The heavily loaded boat, filled with 700 Creek Indians, was making its way northward up the lower Mississippi en route to the Red River and beyond. A cold rain was falling, but the man was well-protected by his thick outer garments and wide-brimmed hat. A shrill sound suddenly pierced the darkness, and he jumped as if a gun had gone off next to his ear. Frantically, he rushed forward toward the wheelhouse to ask why the pilot had rung the bell. "Don't you see it?" the pilot yelled. The man scarcely had time to look before another boat struck Monmouth. The violent collision broke the bows of Monmouth, and the waters of the Mississippi poured in. Split in two, Monmouth went down, taking more than 300 Creeks with it the worst pre-Civil War disaster on the Mississippi River. Word of the collision spread slowly, despite the gruesome losses. The first telegraph line between Washington, D.C., and Baltimore would not be in operation for another seven years. Newspapers, letters and pamphlets had to be carried on horseback, by stagecoach and by steam boat. Newspaper readers in the East might not have had word of the accident for weeks, if they got it at all. The local newspapers picked up the story from the surviving boat officers and crews, but the disaster stopped being news very quickly, and no fingers seemed to be pointed in the aftermath. Years later, corporate and political pressure to improve and update river navigation practices began to grow It was only then that stories about Monmouth and other costly steam boat accidents were revived to challenge the obsolete rules governing river travel. The steamboat had been introduced on the Mississippi in 1811, and by 1820 paddle wheelers had become numerous on the big river. Because of the low unit cost of steamboat freight and the sheer numbers of passengers that could be literally packed on the boats, the steamboat became a favorite of shippers and of ticket agents. The development of the huge Mississippi Basin was due in large part to the steamboat. In the 1830s, some 18,000 Creeks were moved from Georgia and Alabama to new Western lands. A group of 1,600 Creeks marched in the summer of 1837 to Mobile Point, Ala., and later to Pass Christian, Mississippi. A yellow fever epidemic killed more than 100 of those Indians while they waited at the two posts. When the time came in the fall to move the survivors to the territory in the West, the U.S. Army contracted three steamboats: John Newton, Yazoo, and Monmouth. The Creeks were put aboard to start their journey up the Mississippi on the night of October 27,1837 (the exact date in October varies in different accounts). Monmouth was a small steamer weighing 135 tons. Her human cargo, it was said, was crammed onto the boat without regard to comfort or safety. About 700 Creeks managed to get aboard. The three boats made fairly good time on a cold, rainy night. They steamed north of present day Baton Rouge, La., without any trouble. The prevailing practice of boats going upriver was to stay in the slack water close to the banks and, at the bends, to cross to the far banks where the water moved slowest. Boats moving downriver were expected to follow the river channel out toward the middle, where the current moved fastest. But whether or not Monmouth was where it should have been or exactly what happened to cause the collision will probably never be known. It is known that the accident occurred at Prophet Island Bend (today called Profit Island Bend) and that Monmouth was struck by the sailboat Trenton, which was being towed by the steamboat Warren. The violent impact threw hundreds of unsuspecting Creeks into the deep river. Those Indians not immediately swept away struggled desperately for something solid to grasp. The men aboard Warren tried to help, as did the men of Yazoo, which had circled around and rushed to the rescue. Those two steamers picked up whatever survivors they could reach. The cabin of Monmouth had broken off and floated downstream with the crew and about 200 Indians aboard. After floating some distance, the cabin also broke in two parts, spilling them into the river. Some of those men were picked up. Exactly how many Indians drowned is uncertain. Some reports said 240, others about 360, while yet another report put the drowned at more than 400. The most commonly quoted estimate, 311 Indians drowned, comes from the book Indian Removal, by Grant Foreman. There were also two non-Indians lost – the Monmouth barkeeper and a fireman. The man in the wide-brimmed hat who had been standing on the bridge just before the collision was the owner of Monmouth and the principal eyewitness quoted in the newspaper accounts of the accident. As one might expect, this Mr. Eastman defended his steamboat, saying that it was only 12 months old, was fully manned and was guided by well-trained officers. In short, he vigorously denied the rumors that Monmouth was old, rotten and unseaworthy and was in a part of the river where she should not have been. Eastman later said that the accident was caused by the darkness and rain combined with the neglect of Warren's officers, who apparently did not put lights on their tow. The newspapers at the time, however, said nothing about whether or not Trenton had lights, and the only mention of Warren was that it was involved in the collision. No doubt more would have been made about the sinking of Monmouth had it occurred in a less remote area and had more white people been killed. Still, there were some writers who showed their concern for the Creeks who drowned on their way to a new Western home. "What a fate is that of the poor Indians," the New Orleans True American said. "On all sides they are met with battle, murder and sudden death, and reaping the blessings which civilization had brought to them!" Feelings of moral indignation inspired the editor of a weekly newspaper, the Niles National Register, to write, "If retributive justice is meted out to nations as to individuals, what a fearful reckoning is in reserve for this nation." Another writer, recalling a series of atrocities recently inflicted on the Indians, said, "Link upon link is so constantly adding to its length, that the presses of every country ought to have a heading line of 'awful calamities' stereotyped for daily use." But how could such a grisly and unfortunate accident happen? In Steamboats of the Western Rivers, author Louis C. Hunter describes the perils of river navigation. He points out that even considering the wide expanse of water in a river such as the Mississippi, passing steamboats might not be able to avoid each other. Island chutes, sandbars, rapids and low water all could hinder navigation, especially when the boats had flat bottoms and little or no keel to grip the water. Boats going upriver were to follow different courses than boats coming down, but while trying to find the right course, the boats would weave back and forth, often into each other's path. 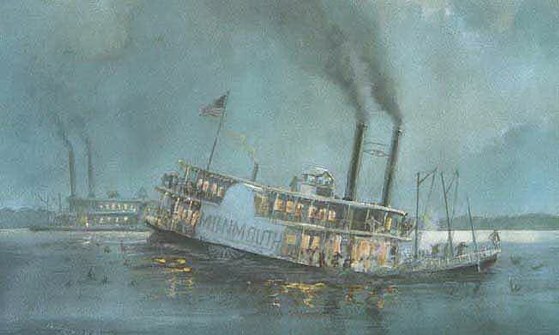 Maneuvering steamboats in unpredictable currents at night, with some bad luck thrown in, might have been enough to cause the Monmouth-Trenton collision. Whatever the reason or reasons for the October 1837 collision, the overcrowding of Monmouth certainly was to blame for the great loss of life when the steamer was struck by Trenton. "Why is such a thing as this permitted?" the New York Observer later asked. "We know not whether there be any legal ratio placed for carrying passengers in steamboats, but this loading is at least treble what would be allowed by law on board a ship." In 1856, Lloyd's of London included commentary on Monmouth in its book Lloyd's Steamboat Disasters: "It is not without some feeling of indignation, that we mention the circumstance that the drowning of four hundred Indians, the largest number of human beings sacrificed in a steamboat disaster, attracted but little attention in any part of the country. Accordingly, the best accounts we have of the matter... have scarcely a single expression of rebuke for the heartless villains who want only exposed the lives of so many artless and confiding people to imminent peril, or almost certain destruction." " When we boarded the ship, it was at night time and it was raining, cloudy and dark. There were dangerous waves of water. The people aboard the ship did not want the ship to start on the journey at night but to wait until the next day. The men in command of the ship disregarded all suggestions and said, "the ship is going tonight." The ship was the kind that had an upper and lower deck. There were great stacks of boxes which contained whiskey in bottles. The officers in charge of the ship became intoxicated and even induced some of the Indians to drink. This created an uproar and turmoil. Timbochee Barnett, who was my father, and I begged the officers to stop the ship until morning as the men in charge of the steering of the ship could not control the ship and keep it on it's course but was causing it to go around and around. We saw a night ship coming down the stream. We could distinguish these ships as they had lights. Many of those on board our ship tried to tell the officers to give the command to stay to one side so that the night ship could pass on by. It was then that it seemed that the ship was just turned loose because it was taking a zig-zag course in the water until it rammed right into the center of the night boat. Then there was the screaming of the children, men, women, mothers and fathers when the ship began to sink. Everyone on the lower deck that could was urged to go up on the upper deck until some of the smaller boats could come to the rescue. The smaller boats were called by signal and they came soon enough but the lower deck had been hit so hard it was broken in two and was rapidly sinking and a great many of the Indians were drowned. Some of the rescued Indians were taken to the shore on boats, some were successful in swimming to shore and some were drowned. The next day the survivors went along the shore of the Mississippi river and tried to identify the dead bodies that had been washed ashore. The dead was gathered and buried and some were lost forever in the waters. Timbochee, my father, at the time of the accident had a bag of money which he had brought with him from the old country. He reported that he had dropped it into the water. He afterwards gave this report to the officials on the following day of the accident. The officials recovered the bag which contained a great amount of gold and paper money. He kept the gold but he turned the paper money over to the officials who promised to dry them for him and return to him. This they did." Thirty five hundred Indians were grouped at Mobile Point waiting for the Creek Warriors returning from Florida to join them. In July, two hundred arrived on board the Merchant. Many deaths occurred during the stay. Captain John Page directed them to select a delegation of 50 men to go in search of a better place of refuge. Pass Christian, Mississippi was selected. There was such a number sick that many of them died on the wharf. Just as the first load got into the Bay many began to die, and the boat had to return to bury them. After making a successful trip the boat returned for another load. Captain Page directed them to break camp and be on the wharf by night to embark. All the sick were brought to the spot, but a violent storm came up that lasted for two days. Page ordered them to return to camp, but they refused. They said it would spoil their Physic. They were very superstitious. Once an Indian made up his mind he would rather die than change it. On July 18 the last load reached Pass Christian. Between March 20 and the end of July one hundred and seventy-seven deaths occurred. Ninety-three at Mobile Point, and eighty-four at Pass Christian. Just on the two days of July 20 and 21, twenty-five Indians died. Many more died the next month, which included Samuel Moniac and David Hale. On August 21, two schooners arrived with two-hundred and sixteen friendly Creek Warriors from Florida, and on September 14, two-hundred and eight more departed Tampa Bay, in route for Pass Christian. It was not until October 16, 1837, that the last of the poor Indians arrived in New Orleans from Pass Christian. The fever was raging in town (New Orleans? ), and they were hurriedly passed through. Six Hundred and eleven (611) Indians were packed on board the Monmouth and departed up river. Through negligent handling, at night by the Captain, she took a wrong course around Profit Island. This channel was reserved for downward bound vessels only. Unknowing, to the Captain, the Warren had the disabled Trenton in tow. They collided with the Monmouth and cut her in two. One half sunk immediately, and the other drifted some distance before it went down. Three Hundred and eleven (311) Indians died, with many of the survivors badly injured. Four of the 12 children of Jim Boy were among the dead. On October 29 the remaining Indians were loaded onto the Farmer, Far West, and Black Hawk in cramped conditions. In complete disregard of the agreement that each person should have at least 7 square feet of space, they pushed them on board anyway. After the arrival in Arkansas, many of them were too weak to continue the journey and died. Only a little over 4,000 Creek Indians traveled by boat. The rest of them walked to Oklahoma along side, and with the Cherokee. At some point in time, national attention to the hardship that the Creek Nation went through should be made known. Although there has been some mention of the Creeks, most references to the Indian Removal refers to the Cherokees.